Mirror Mirror is pretty unknown to most horror fans, but it’s a pretty decent flick nonetheless and boasts stars like Karen Black and Yvonne De Carlo among its cast! I had heard that it was along the lines of Carrie and The Fury, so I decided to give it a try, especially since the lead character is considered a “goth” (I did a piece on goths in horror films if you feel like taking a look). Mirror Mirror tells the tale of gothy Megan (Rainbow Harvest), who moves from L.A. to a small town with her mom (Karen Black) after her father’s death. Megan finds an old mirror in her room and insists on keeping it, even though it’s a creepy old thing. She then starts school but runs into the usual gaggle of cheerleaders and jocks who don’t appreciate her funerary attire. She makes friends with good girl Nikki, but the popular kids still make Megan’s life a living hell. Soon, Megan discovers that the mirror gives her powers and she can make things happen to those that ridicule her. Pretty soon her enemies are dying left and right and the mirror’s powers become too powerful for Megan to control. Can Nikki save Megan from the dark side and whatever lives on the other side of the mirror? Mirror Mirror might share some similarities with Carrie (shy outsider, weird mom, psychic powers, a friend who tries to save the lead, etc. ), but it stands on its own quite well. I really enjoyed all the characters and the story; they still felt unique even though they were obviously influenced by other films. Megan was a fun character, though I initially thought she would have more backbone and actually stand up to the annoying popular kids rather than running away and hiding from them. Gotta love her goth look, which looks heavily influenced by Beetlejuice’s Lydia (it doesn’t help that Rainbow Harvest looks a lot like Winona Ryder). I also loved the over-the-top performance by Karen Black as Megan’s unstable mother (good god, that pastel pink lipstick has GOT to go!) and seeing Yvonne De Carlo as an estate dealer who tries to help Megan once she learns the truth of the evil mirror. Plus, there is quite a high body count, and while the deaths aren’t necessarily gory or bloody, most of them are still pretty neat. Standouts include the shower scalding scene and a garbage disposal death! There are several bloody scenes, including a gushing nose bleed scene and the mirror itself, which regularly oozes blood. Director Marina Sargenti uses an interesting blue palette for most of the film and sets up varying POV shots that keep the viewer engaged. I especially liked the POV shots of the demon behind the mirror looking out at all those that approached it. The screenplay, written by Annette Cascone and Gina Cascone, also deserves props, especially for its twist ending! Mirror Mirror is an interesting flick that deserves to be seen by more people. It certainly wears its influences on its sleeve, but it still manages to be intriguing in its own special way. If you are looking for an early ’90s gem, check out Mirror Mirror! I grew up watching this movie, and it was always one of my favorites. 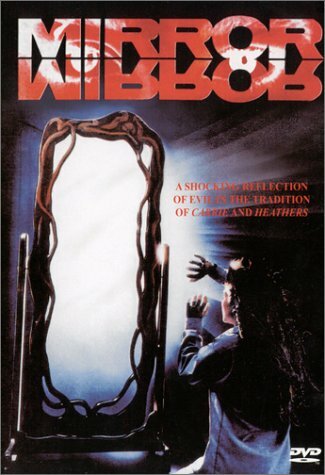 I kind of wish they would do a remake or another adaptation of it in order to introduce a new audience to the mirror. Especially since horror movies have mostly been sucking lately. I've been watching horror films since I was 3 years old, and they never really scared me even from a young age. However, I still say that the ending of Mirror Mirror scared the crap out of me every time I watched it.